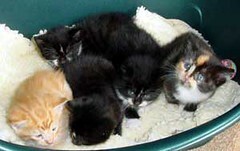 A mother cat and her five kittens were discovered in an elephant enclosure at the Colchester Zoo in the UK. Zoo staff found the kittens and were completely surprised over how the cat and kittens got there. The mother and her kittens were living in the elephant enclosure for about three weeks, and fortunately none of them were trampled were the elephants. Those cats are definitely some lucky cats. Elephants weight about 27,000 times more than a 3 week old kitten. Quite a difference. This entry was posted on Friday, May 18th, 2007 at 3:56 am	and is filed under National Dog, Cat & Pet Info. You can follow any responses to this entry through the RSS 2.0 feed. Both comments and pings are currently closed. Elephants are smarter than people.